This isn’t going to be a long post as my incredibly busy week, complete with not enough sleep, ends. It was not a good eating week, and as a result, this week’s scales reported a 1.6 pound increase to 317 pounds. This was a direct result of stress eating early in the week. Though I followed the Carb Addicts Diet rules (save for an accidental fail), way too many calories were taken in. If I’d remained sensible, which is what I started returning to on Wednesday, I’d have been OK. Speaking of Wednesday, our group at work had our outing to Sakura House for tasty Japanese food. 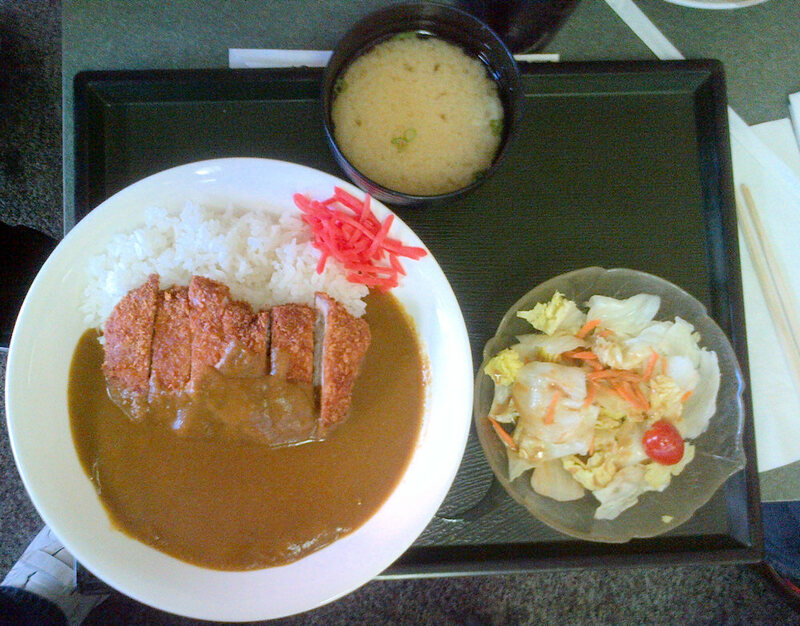 I got the Katsu Curry Rice (breaded, boneless pork cutlet, rice, and Japanese curry sauce), which came with miso soup and a salad. Very tasty, and not heavy on calories. Well, not that my site move from DreamHost to KnownHost is over, I’m hoping to get back on track with the weight loss. Stress eating is going to be a real danger for sure, especially as my job becomes more stressful over the next few months. This entry was posted in Weight Loss and tagged Carb Addicts Diet, Japanese Food, Sakura House on March 15, 2014 by AstroNerdBoy.